The accident at the Fukushima Dai-ichi Nuclear Plant posed a serious problem whether we can live with nuclear energies. On the other hand, its risks of climate change and air pollution makes fossil fuels hazardous, therefore issue we face is not so simple. Can we build a sustainable civilization while maintaining sufficient energy and good environment? Inviting international experts, focusing on relationship between global issues of the energy and environment, this Conference will discuss what kind of energy we should choose and how we should build our energy systems in the future. The Discussion 1 will consider how Japanese should face risks, based on the contentious keynote speech by Prof. Wade Allison, the author of “Radiation and Reason”, that there is no need to fear radiation exposure up to 1Sv a year. The Discussion 2 will debate on the Zero Nuclear Power Policy, which has livened up again triggered by a remark of Former Prime Minister Koizumi, whether it is possible and desirable or not, based on the keynote speech by Dr. Tatsujiro Suzuki, Vice Chairman, Japan Atomic Energy Commission. The Conference will be broadcasted on the Nico Nico Live and on U-stream with simultaneous interpretation. Time: 13:00 - 18:00, Sunday, December 8, 2013. Place: Kuramae Hall, Tokyo Institute of Technology. Wade Allison, Professor emeritus, University of Oxford. Paul Blustein, Nonresident Fellow, Brookings Institution. Tetsuo Sawada, Assistant Professor, Tokyo Institute of Technology. Moderator: Nobuo Ikeda, Director, Agora Institute. 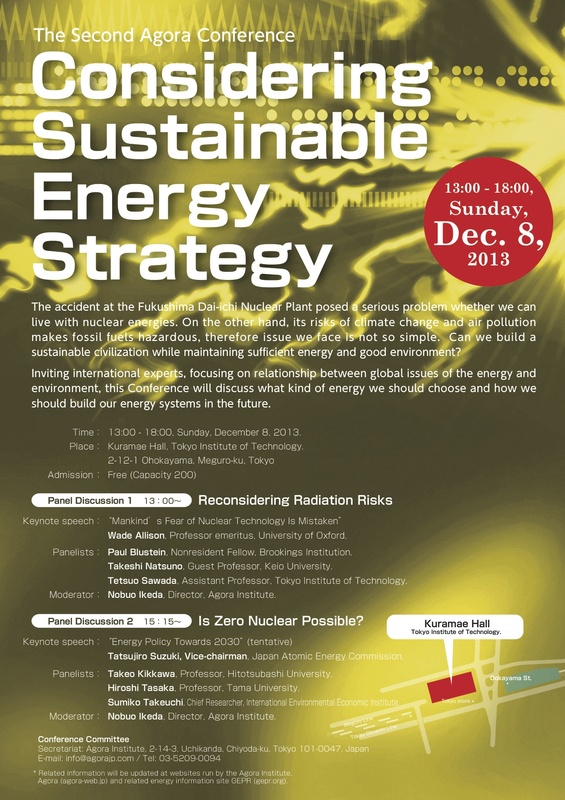 15:15 Panel Discussion 2: Is Zero Nuclear Possible? Tatsujiro Suzuki, Vice-chairman, Japan Atomic Energy Commission. Hiroshi Tasaka, Professor, Tama University. Takeo Kikkawa, Professor, Hitotsubashi University. Sumiko Takeuchi, Chief Researcher, International Environmental Economic Institute. * Related information will be updated at websites run by the Agora Institute, Agora (agora-web.jp) and related energy information site GEPR (gepr.org).